Do a comparison of survey software. No credit card required. Cancel anytime. Try all features* for 14 days for free. Plan includes licence for one device (iPad). Any additional device is € 9 per month. Plan includes licence for one device (iPad). Any additional device is € 90 per year. Plan includes licence for one device (iPad). Any additional device is € 19 per month. Plan includes licence for one device (iPad). Any additional device is € 190 per year. Plan includes licence for one device (iPad). Any additional device is € 39 per month. Plan includes licence for one device (iPad). Any additional device is € 390 per year. Plan includes licence for one device (iPad). Any additional device is $ 10 per month. Plan includes licence for one device (iPad). Any additional device is $ 100 per year. Plan includes licence for one device (iPad). Any additional device is $ 22 per month. Plan includes licence for one device (iPad). Any additional device is $ 220 per year. Plan includes licence for one device (iPad). Any additional device is $ 44 per month. Plan includes licence for one device (iPad). Any additional device is $ 440 per year. Plan includes licence for one device (iPad). Any additional device is £ 8 per month. Plan includes licence for one device (iPad). Any additional device is £ 80 per year. Plan includes licence for one device (iPad). Any additional device is £ 17 per month. Plan includes licence for one device (iPad). Any additional device is £ 170 per year. Plan includes licence for one device (iPad). Any additional device is £ 35 per month. Plan includes licence for one device (iPad). Any additional device is £ 350 per year. Plan includes licence for one device (iPad). Any additional device is C$ 14 per month. Plan includes licence for one device (iPad). Any additional device is C$ 140 per year. Plan includes licence for one device (iPad). Any additional device is C$ 30 per month. Plan includes licence for one device (iPad). Any additional device is C$ 300 per year. Plan includes licence for one device (iPad). Any additional device is C$ 62 per month. Plan includes licence for one device (iPad). Any additional device is C$ 620 per year. Plan includes licence for one device (iPad). Any additional device is AU$ 14 per month. Plan includes licence for one device (iPad). Any additional device is AU$ 140 per year. Plan includes licence for one device (iPad). Any additional device is AU$ 30 per month. Plan includes licence for one device (iPad). Any additional device is AU$ 300 per year. Plan includes licence for one device (iPad). Any additional device is AU$ 61 per month. Plan includes licence for one device (iPad). Any additional device is AU$ 610 per year. 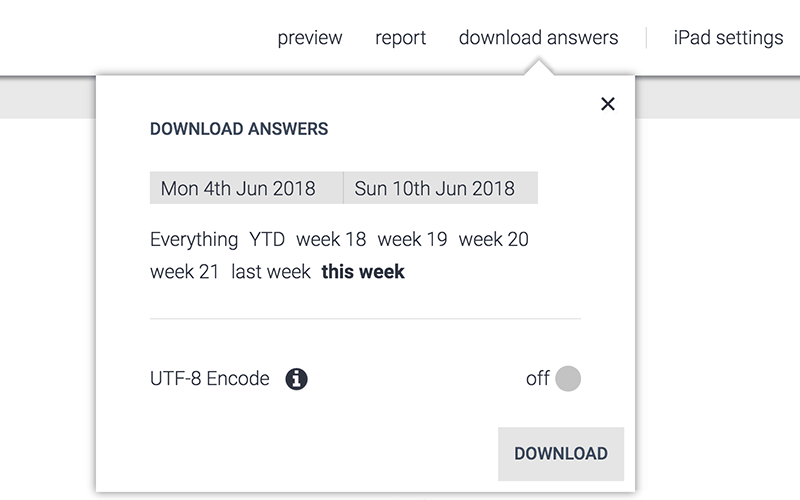 *A maximum of 200 answers are allowed in the free trial. 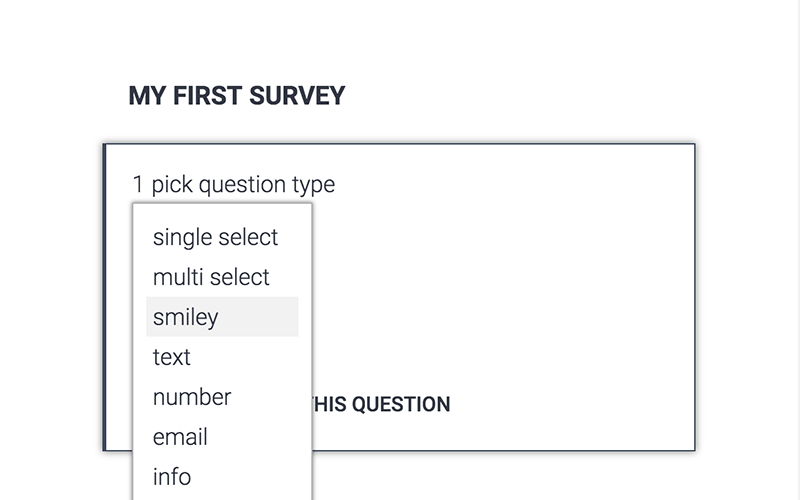 Design your surveys with 7 different question types: smiley, text, email, number, single-select, multi-select and info. Branch out and segment data based on previous answers. 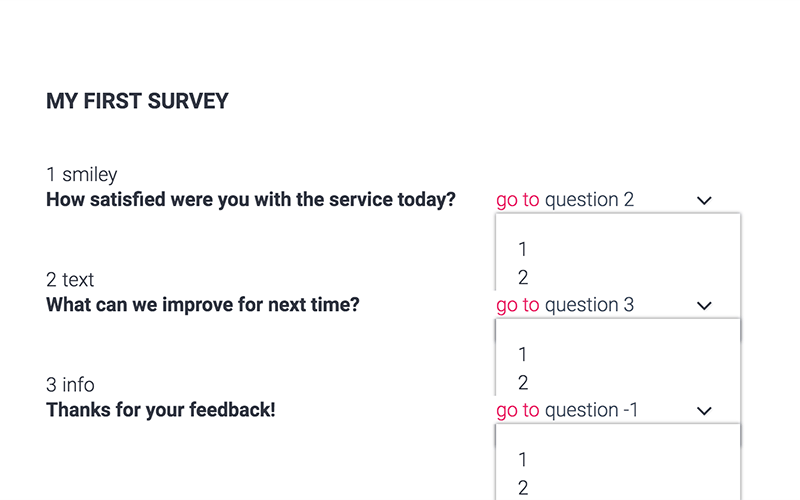 Make customer feedback responsive, shorter and more personal. One Touch makes the user experience convenient. Disable navigation buttons to ensure a quick and smooth interaction. No internet? If the connection suddenly drops, your responses are stored in the survey app. Use the iPad survey in the field and upload later. 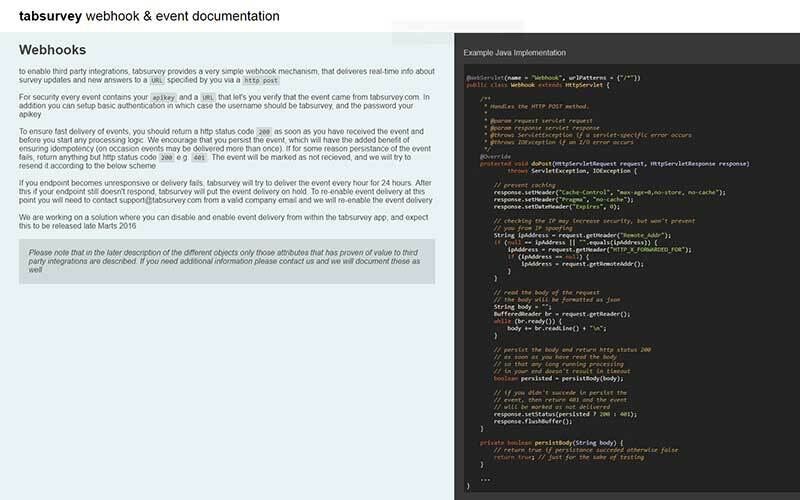 View your Live Reports instantly in your browser and track your live data minute for minute. 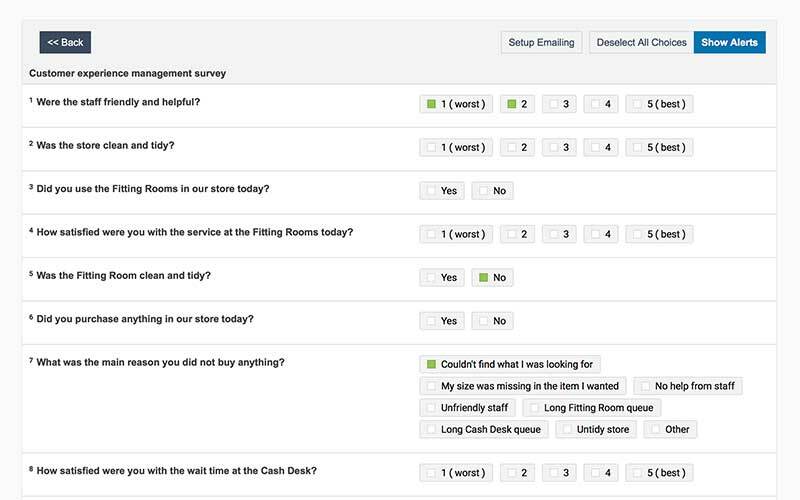 Once you sign up for our survey software, you will find many useful survey templates in your account ready to use. Browse our templates and get inspired! Download your data for filtering and data analysis to improve customer satisfaction. Work with your results in Excel for powerful insights. Expand your reach with our online surveys designed like our free survey app. Send online through mail, social media or homepage. 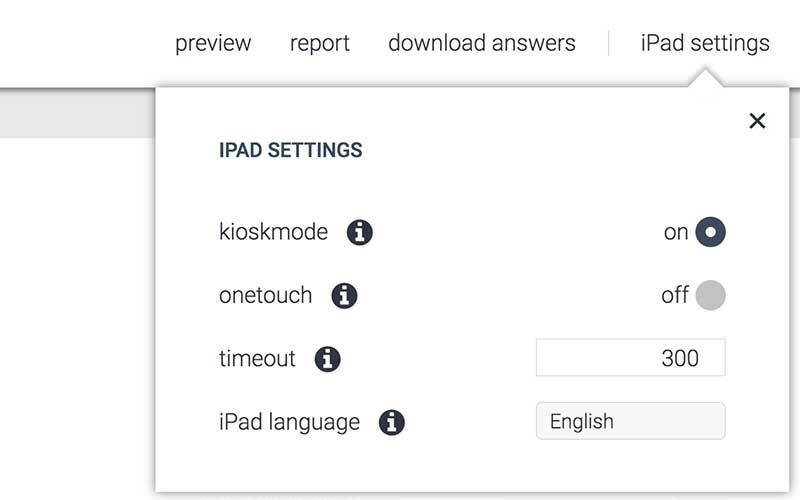 Avoid accidental data loss and lock your current survey to the iPad with Kiosk Mode. Great usability made simpler. Personalize the start screen with your company branding to appeal for more feedback. Branding has never been easier. 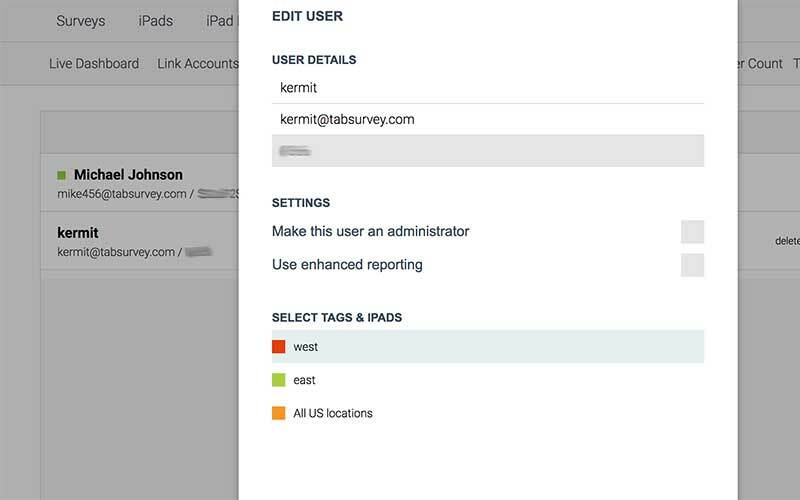 Use location manager to publish new surveys remotely to any iPad. 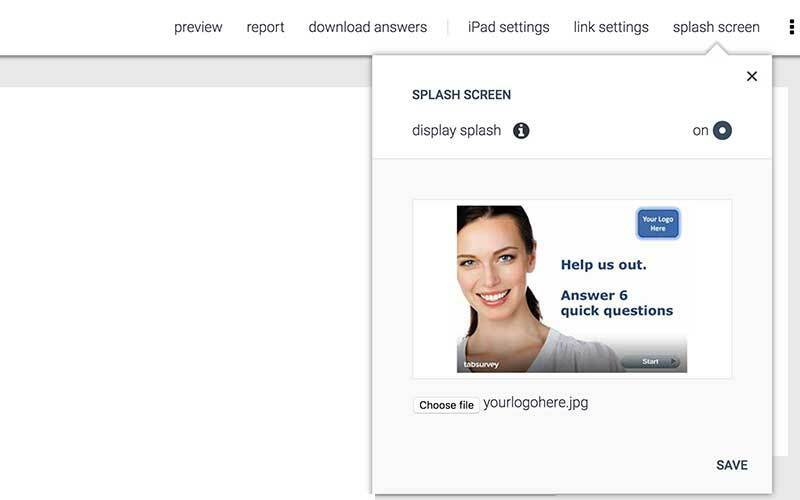 The publish function enables you to update your survey from your desk. 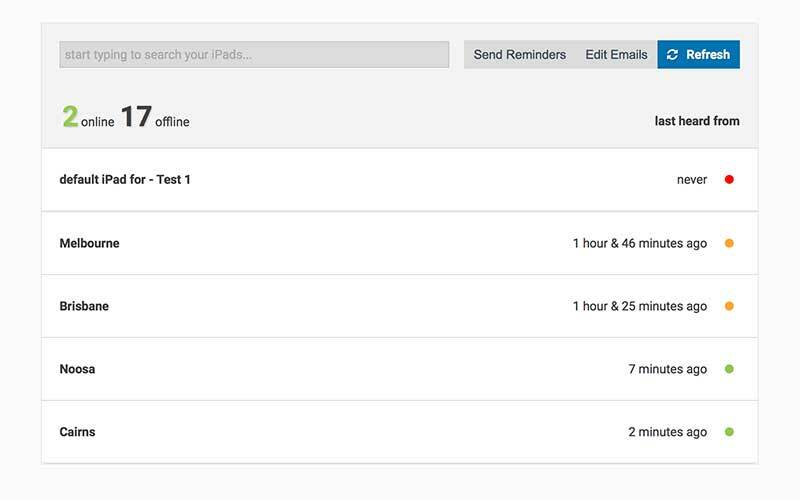 Monitor your iPads from afar to ensure that the system is monitoring customer satisfaction efficiently. Prompt employees when iPads are offline. React to customer satisfaction with notifications. 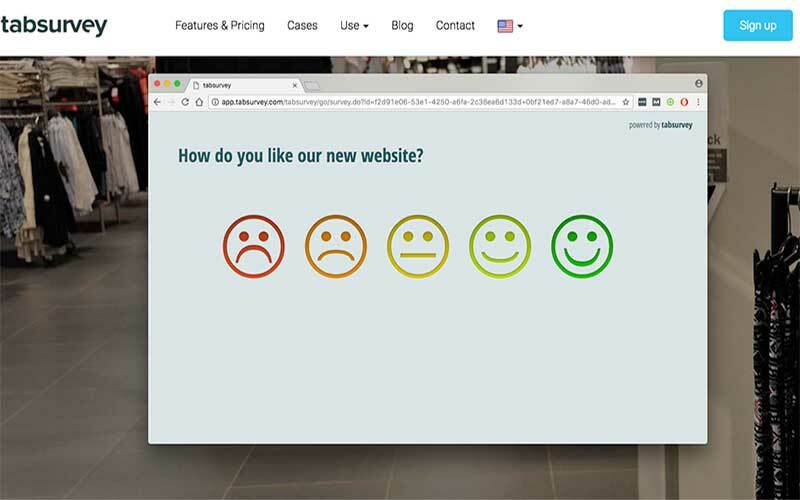 tabsurvey notifies you of instant customer feedback, that requires your immediate attention. Are you measuring NPS, cNPS or eNPS? 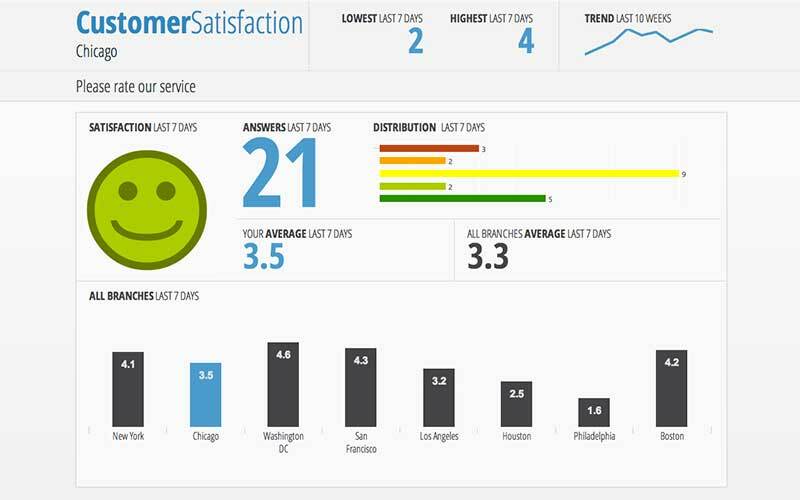 For our enterprise customers we can provide dedicated NPS reporting to match your needs. If you running your surveys in more than one language, then our iPad survey software lets your respondents choose their preferred language. 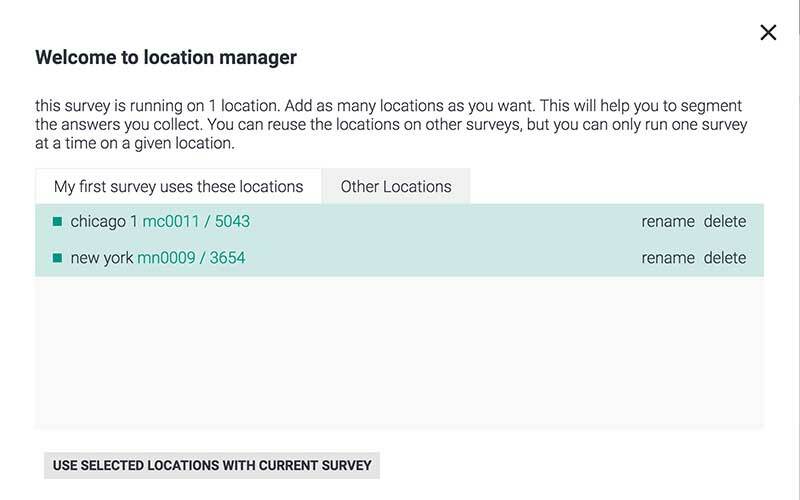 If you have a large network of locations, you can add users and limit access to their area. This could be related to store, area or country level. Do you require your data to be delivered to a url? tabsurvey can provide the necessary documentation and know-how to help you set up. 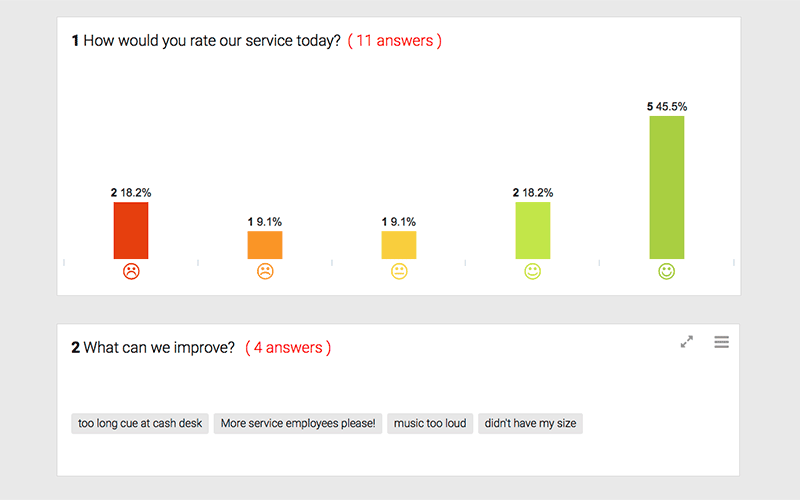 Want to engage your organization more in customer feedback? 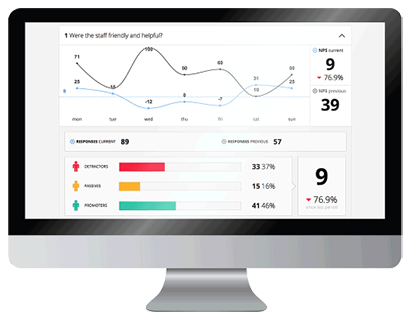 Live dashboard provides an effective tool with selected KPIs like NPS. 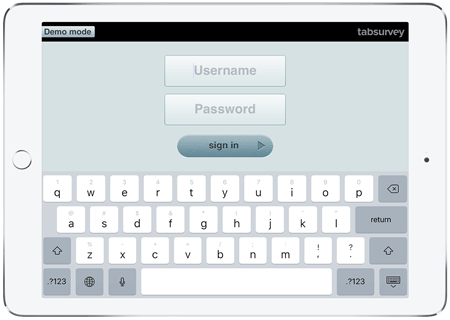 tabsurvey can tailor a specific Live Dashboard to your needs. Did you finish your comparison of survey software? 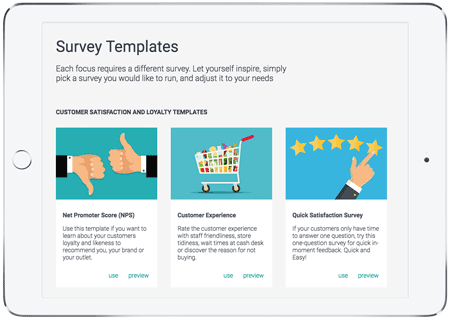 You can download our free survey app right now and get started with your free plan with all paid features enabled for 14 days. No credit card needed. Have a question regarding your comparison of survey software? If you don't see the features you are looking for, then drop us a line, and let's discuss your needs.